The Institute of Horticulture made history for professional horticulturists when it became Chartered on 21 July 2014. It is now The Chartered Institute of Horticulture CIH. The formal celebrations began on 1 September 2014 when The Marchioness of Salisbury, Patron of The Chartered Institute of Horticulture, hosted a Garden Party at Hatfield House to celebrate the grant of the Royal Charter, by Her Majesty the Queen. The Garden Party was a thank you to Institute members, stakeholders, influential friends and sector partners for their support during the application for Chartership and a celebration of this moment in the history of professional horticulture. Lady Salisbury and the Trustees of the Institute were delighted to be joined by over 200 CIH members and colleagues from all sectors of the horticulture who gathered for speeches and afternoon tea in the stunning locations of the Marble Hall and Armoury at Hatfield House. Guests included representatives from Defra, the RHS, The HTA, HDC, Royal Botanic Garden Kew, The Royal Parks, Perennial, Plant Heritage, East Malling Research, Historic Royal Palaces, Natural England, Sainsbury’s Supermarkets Ltd, Commonwealth War Graves Commission, Horticulture Innovation Partnership, Woodland Trust, universities and colleges from across the UK and Ireland and many more. The first ever Chartered Horticulturists were announced at the Garden Party; Leigh Morris, President, Andrew Gill, President-Elect, Heather Barrett-Mold, Past President and Education Sector Representative, Dennis Clarke, Honorary Secretary, Owen Doyle, Chair Membership Action Group and John Whetman, Honorary Treasurer. 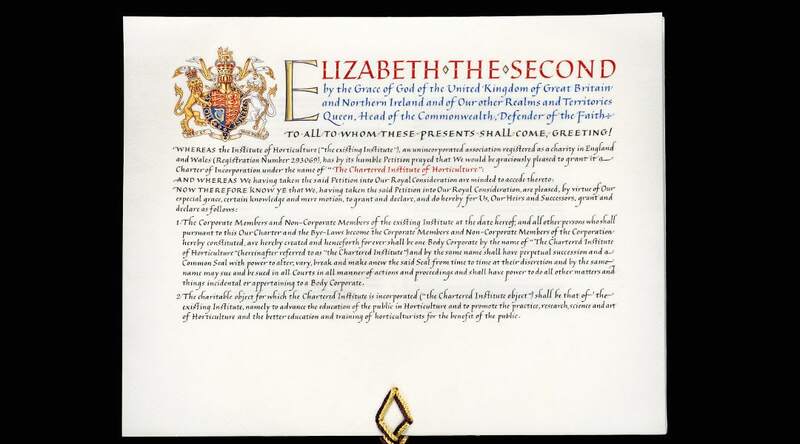 To gain a Royal Charter for the Institute has been an aspiration since the Institute’s inception in 1984. At the Garden Party, Andrew Gill C Hort FCIHort, President-Elect said “This is indeed a momentous day for the Institute and a great way to celebrate the Institute’s 30th birthday. The Institute’s aim is to further professionalise horticulture. Members are now part of an Institute which holds the recognition and benefits of Chartered status. After the event The Marchioness of Salisbury said: It was a great honour to have been asked to unveil the Royal Charter at the Garden Party on Monday. At least two hundred guests made the effort to come and celebrate, many very distinguished, and all interesting and busy people. They came from every corner of the British Isles so we should all feel confident of the future of the Chartered Institute of Horticulture.